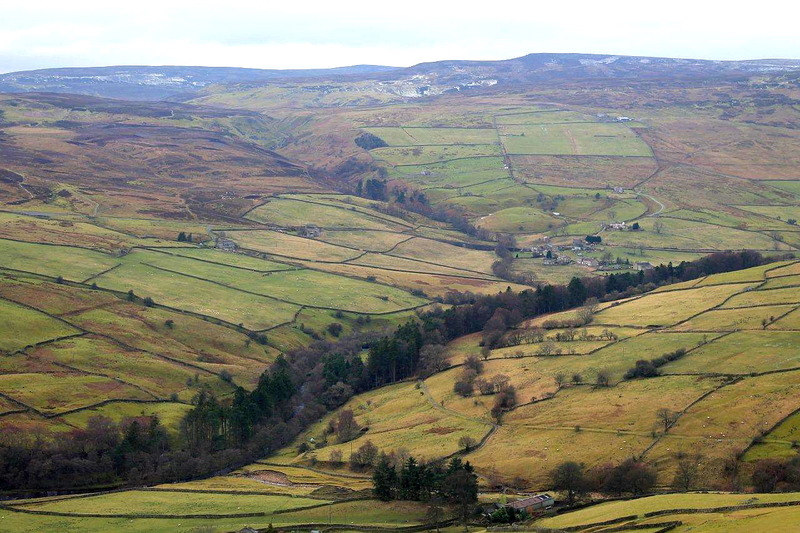 THERE’S a village in the hills above Reeth that is an absolute pleasure to visit because the only people who go there are the postman, the coalman, and the villagers themselves. Forgive me for sounding sexist. I know there are many postwomen in these rural areas. It’s just easier to say postman. I don’t know about coalwomen though . . . 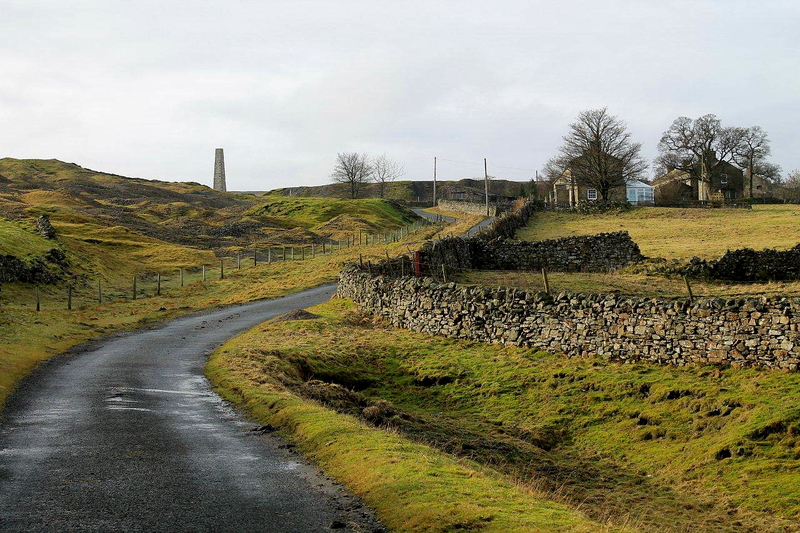 This Pennine village is called Hurst and there’s only one road in. 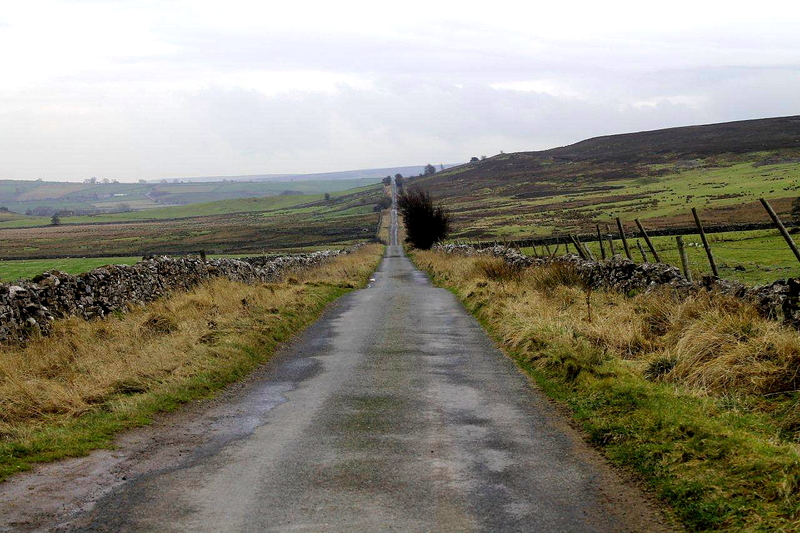 The road out is the same road – and it’s narrow. Hurst is a scattering of cottages and farms. I imagine it was once quite a busy place because there’s a building that used to be a pub, another that was once a school, and a farm on the crown of the moor that goes by the interesting name of Schoolmaster Pasture. There was a time when I came up here a lot. 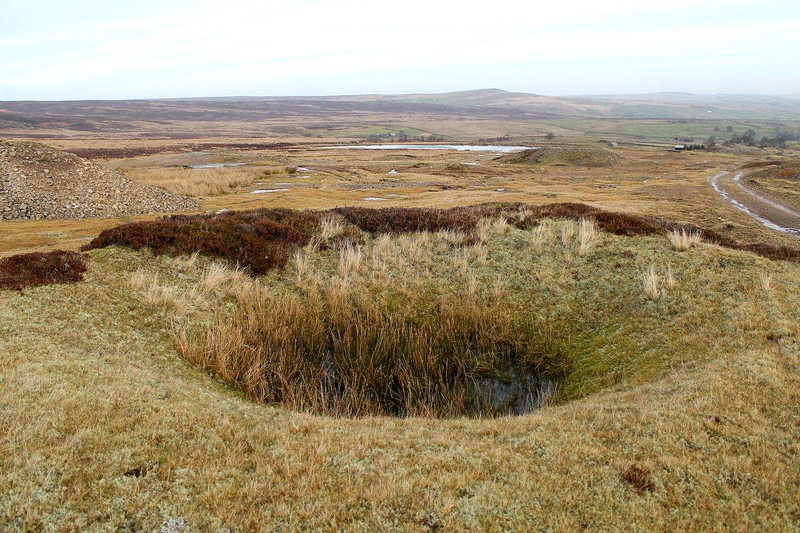 I used to do a bit of fell-running – not competitively because I’m rubbish – but Hurst is the perfect place from which to launch yourself onto swelling moorland and just run forever with the sun on your neck. The last run I did from Hurst was about three years ago. I’m a bit heavier and slower, and stiffer and older and more disgruntled, these days. But what the heck. Trooper Thornton fought his way back so there’s hope for me yet. So today I’m embarking on a short walk from Hurst. A couple of hours at the most. Because I’ve discovered a new formula for walking. Instead of sliding out of bed in total darkness, driving across the Pennines to the Lakes, spending a day on the fells then heading back in the dark, I’m developing a form of guerilla walking. Get up late to fool the neighbours, chuck some gear in a bag, drive into the Pennines, walk for two or three hours, and get back while there’s sufficient light to cut a cabbage on the allotment. It’s not half as exciting as crossing the Khumba Icefall, I expect, but it gets me out of the house. And it’s better than sitting in a cold polytunnel looking at tomato plants that should have been pulled up three months ago. Still some tomatoes on them, mind. But I haven’t eaten one since before Christmas. 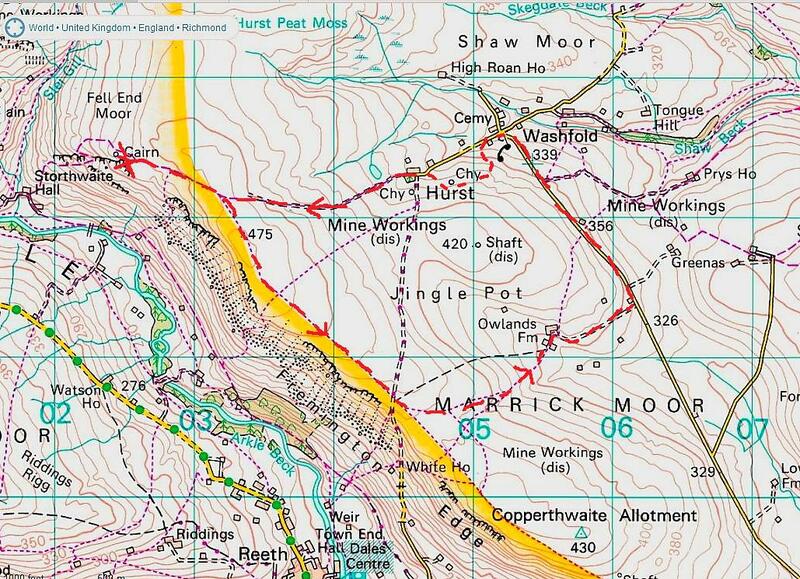 I used to have a book about the lead mines at Hurst but I can’t find it. 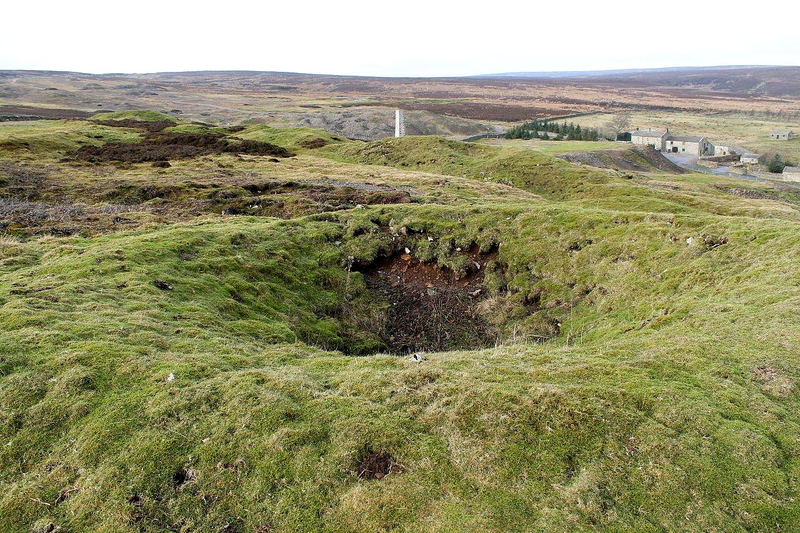 An entire hillside is pockmarked with little shafts that have been sunk along the course of the mineral vein, which runs more or less parallel to the linear village. Actually, “village” is a bit of an ambitious word – an overstatement. Hurst is more a string of houses with big gaps between them at the side of a road that a tired man could lie across with his head and feet on different verges. A tired coalwoman probably could as well. 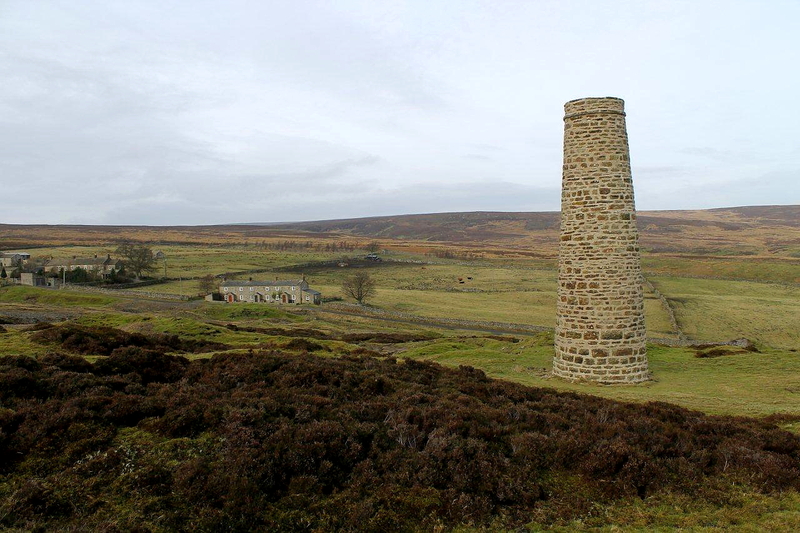 A couple of big chimneys stand prominently on the fellside. They probably served the engine houses that hauled ore from the shafts or pumped water from deep workings, though I don’t see any associated ruins. But in a country where countless thousands of important historical monuments have been dismantled by local people hungry for quarried stone to build houses, that’s not surprising. 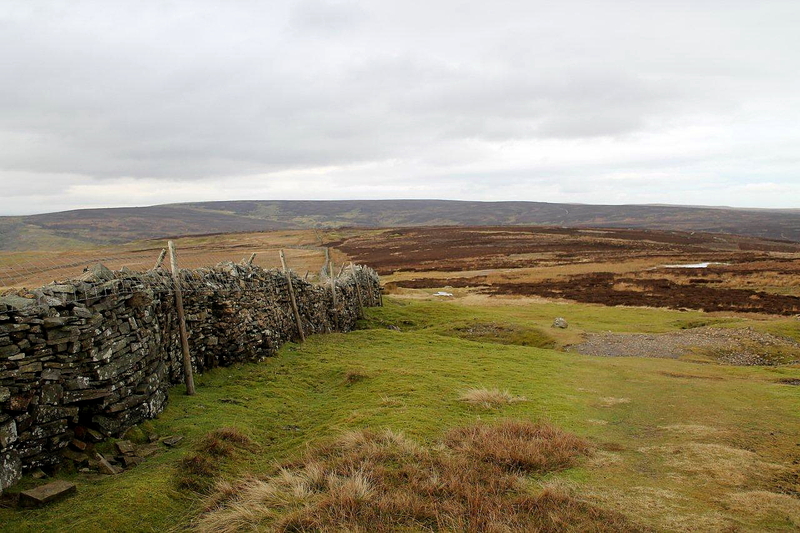 So I leave Hurst along a track that winds between grouse butts and takes me westwards over bleak moorland to a cairn on Fell End Moor. I like it up here. 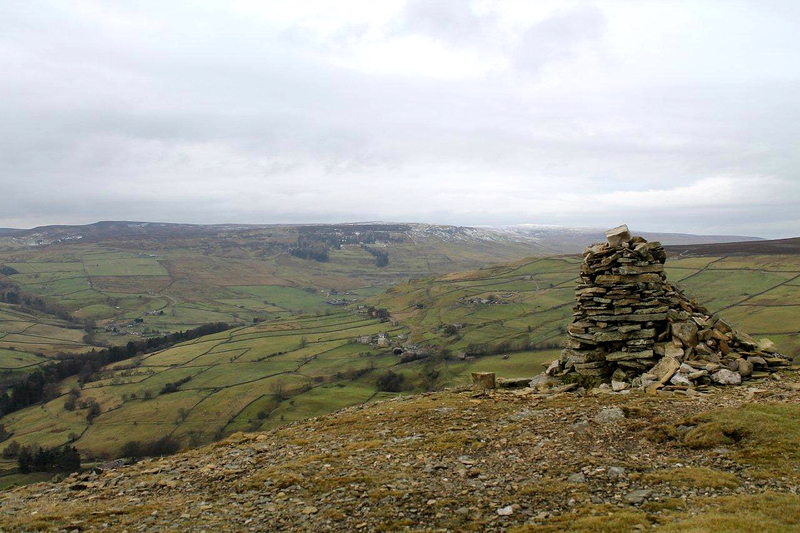 I like to sit at this cairn (in the first picture) and gaze down into the wilds of Arkengarthdale. The view changes. 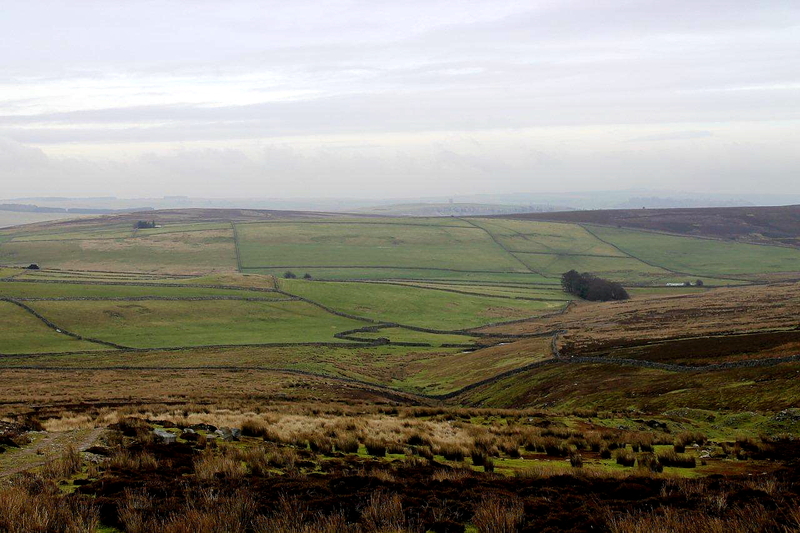 Today there is snow on the distant moors. At other times of the year the hay meadows are full of flowers and men are burning heather to produce new shoots for grouse to pluck. 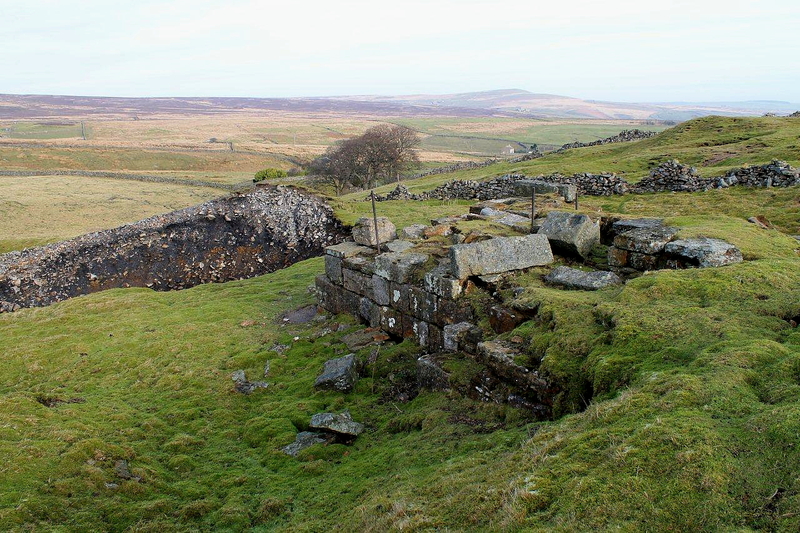 A hundred-and-fifty years ago the hillsides were gashed open with raw lead mine hushes. Go back far enough and there were Viking settlements. I don’t remember them, though. Memory is a fickle companion. 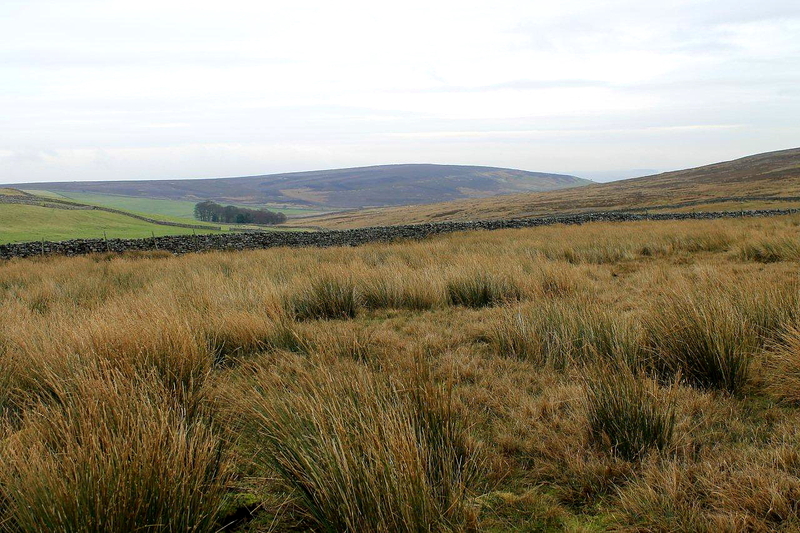 And from Fell End Moor I head south-east along the escarpment known as Fremington Edge. The first time I walked the edge I was accompanied by my wife, Anne, and my 11-year-old son. Fergus will be 30 this year and probably doesn’t remember the outing. Next time I come up here I’ll bring his three-year-old (nearly four) daughter. I shall indoctrinate her with lead-mining lore and lots of rubbish about coalwomen, because grandfathers have that power and use it unsparingly. I grew up believing that There’s a Moose Loose Aboot this Hoose was Rabbie Burns’ greatest poem, so I’m merely perpetuating a tradition. 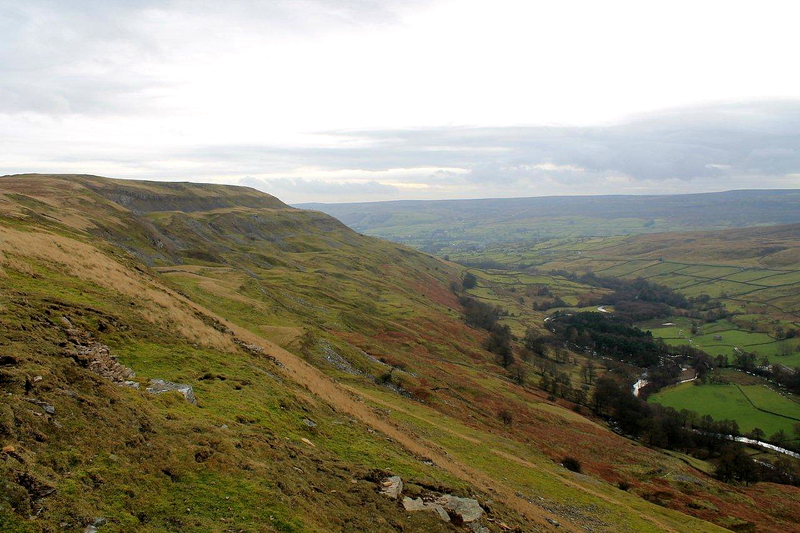 On Fremington Edge my walk enters a completely different dimension. 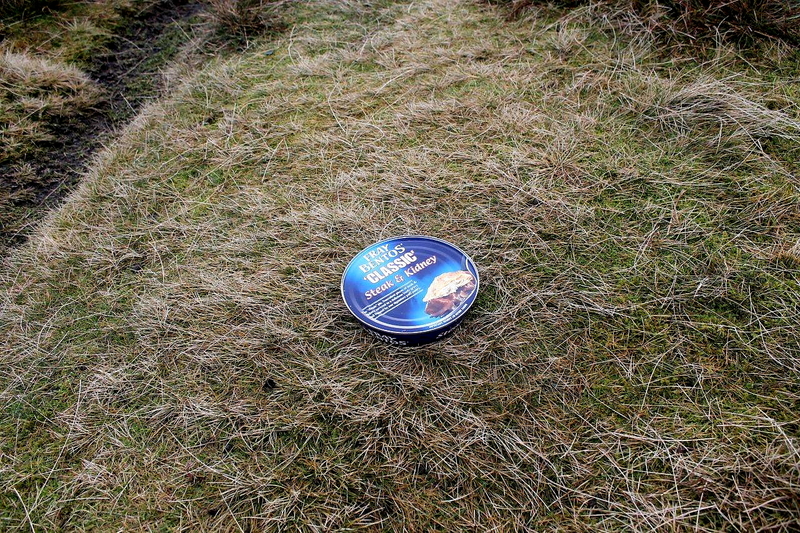 I stumble upon a Fray Bentos steak and kidney pie lying in the middle of the path. This has me scratching my head because I can’t imagine who would have carried a tinned pie up here and accidentally dropped it on the turf without hearing its telltale thud. I approach this conundrum laterally. The pie could have been thrown in anger from an open-topped double-decker bus travelling along the seafront at Mar del Plata on a daytrip from Buenos Aires, drifted north to the Gulf Stream then been caught in the North Atlantic Drift, washed through Shannon, Fastnet and Lundy into Irish Sea on friendly tides, then pounced on by an osprey and dropped on Fremington Edge when it spied a fat red grouse clucking in the heather. Sorted. The sell-by date is December 2015, so I’m in luck. 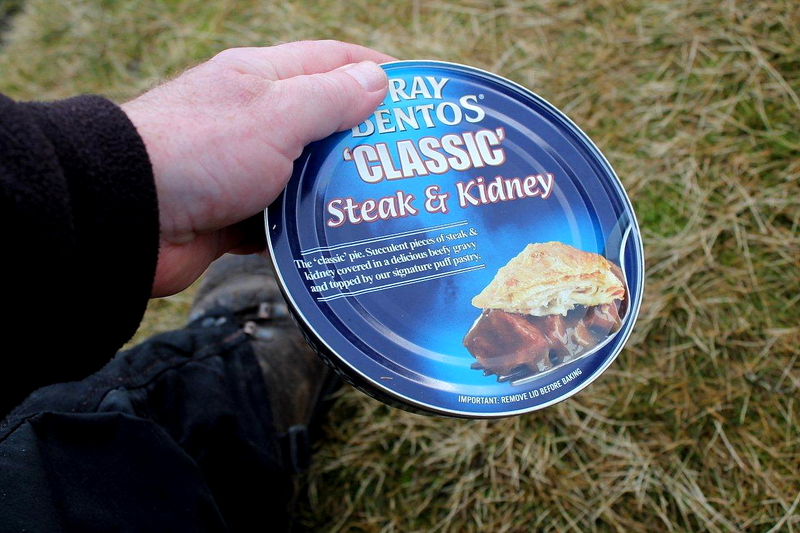 I marvel at the coincidence of the discovery, because the topic of Fray Bentos steak and kidney pies was raised in the previous post. And not for the first time. 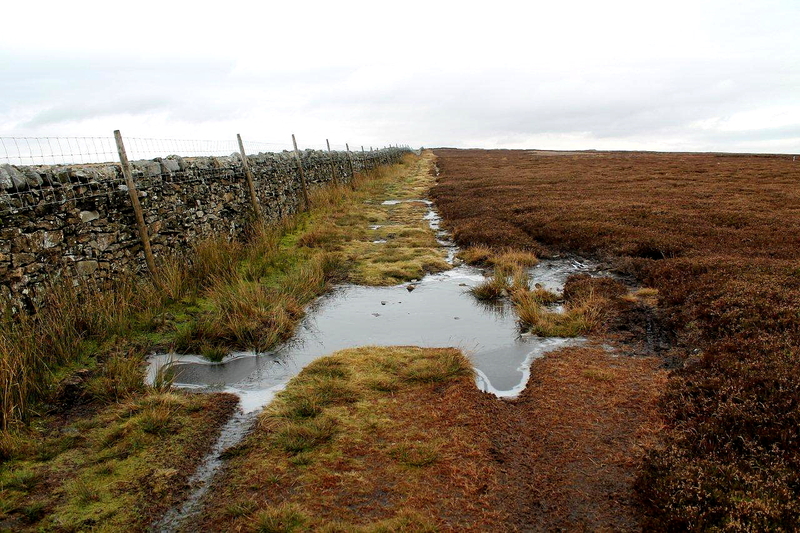 There’s a thin, icy wind blowing across Fremington Edge, the ground is firm and the puddles are frozen. It’s no place to hang about. 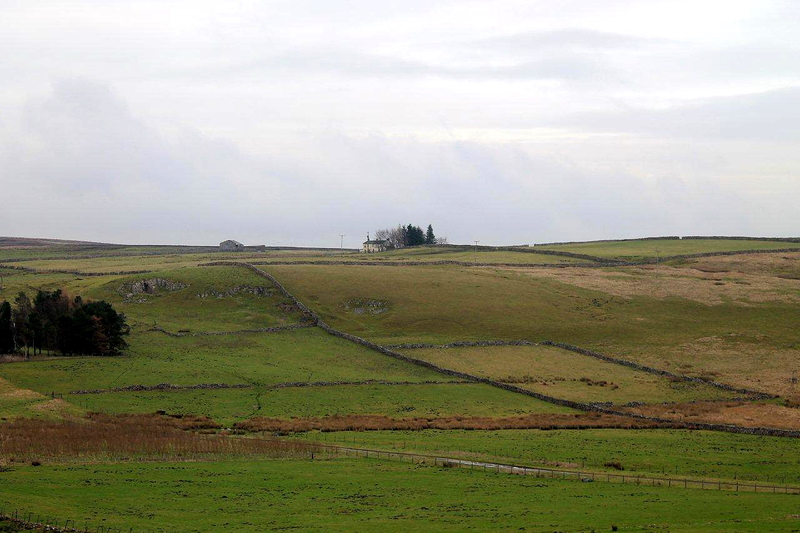 I walk eastwards briskly and veer down a track to Owlands Farm and walk back to Hurst through meadowland. Several years ago, one September when I was out running, these meadows were absolutely chock full of mushrooms. I returned the next day with Anne and we filled two carrier bags in a matter of minutes. Some were big, flat horse mushrooms, others the pure white rounded type with pink fleshy gills. Bloody delicious. Can’t beat foraging. But nothing’s growing today – except pangs off hunger at the memory. Still, what does a man need with mushrooms and memories when he has a freshly-foraged Fray Bentos steak and kidney pie in his sack? 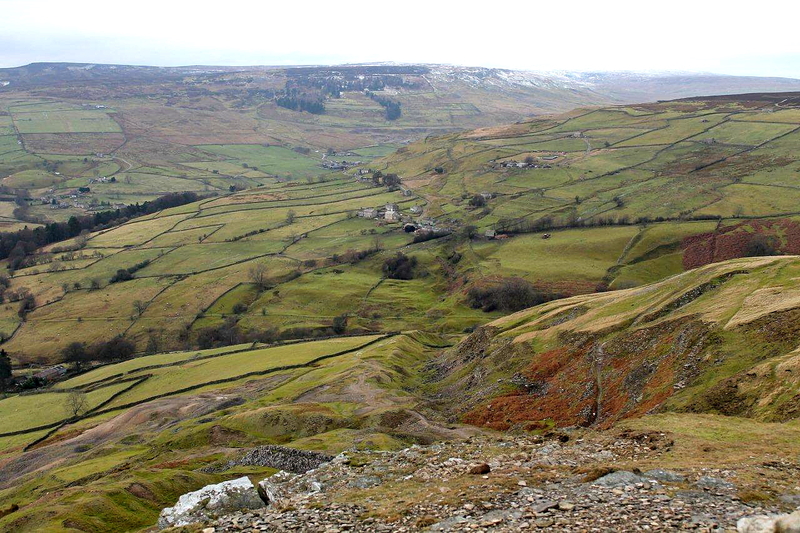 This entry was posted in Climbing, Environment, Footpaths, Fray Bentos, Hiking, History, Industrial archaeology, Mountains, Ruins, Running, Vikings, Walking and tagged Cumbria, Lake District, Mining History, outdoors, Pennines, The Lakes, WPLongform. Bookmark the permalink. 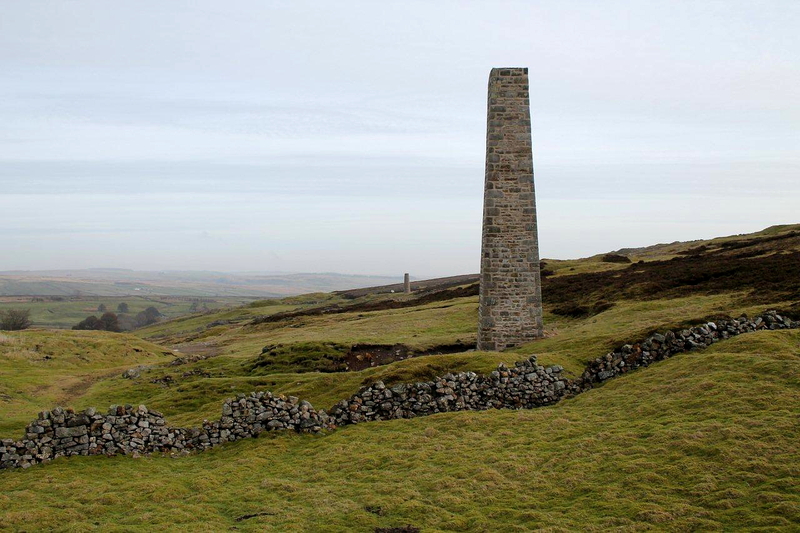 A super read, with all my favourite ingredients…lead mines, landscape and pies. We used to find lots of field mushrooms in Ayrshire when I was a young ‘un, but here in Wales they seem rare…or maybe I’m not looking hard enough 🙂 Glad you enjoyed the serendipitous find! Hi Teigl, glad you liked it. It’s amazing what you can stumble upon in the hills. Mushrooming used to be a big thing when I was a kid, but people don’t seem to bother much these dyas. Big shame that. Not only is the tin of Fray Bentos a mystery, but a sheep impersonating Miley Cyrus (third to last photo) is equally baffling. And I would err on the side of caution and include ‘coalwoman’ in case your blog is read in Belarus. 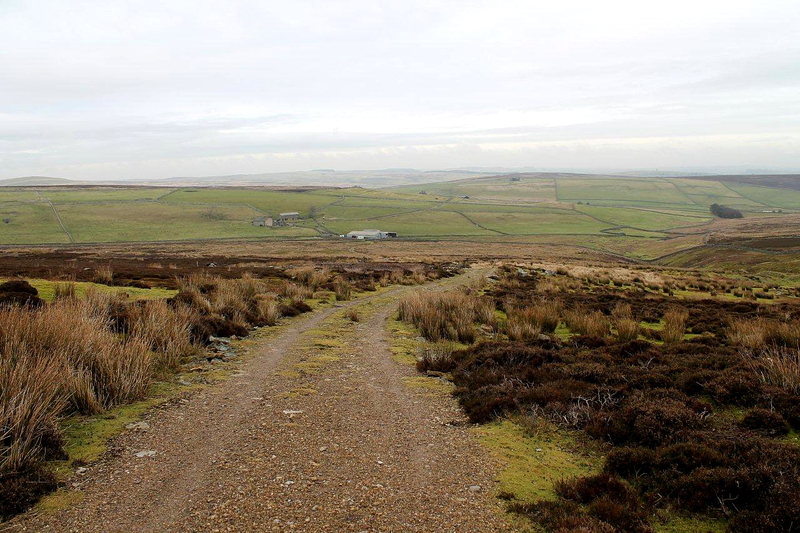 Your photos remind me of the Bowland countryside and the hills around Pendle and are compelling me to get back out there and squelch through the mud, feel the biting wind on my face, tramp the lanes in the dark with my flashy headtorch. Fray Bentos! Conspiracy theorists would have a field day with that discovery. Do you know, Chris, it’s only just occured to me that when I was taking the sheep picture I could hear someone singing Wrecking Ball in the background. Some coincidence that. Perhaps I should buy the sheep and enter them on Britain’s Got Talent. 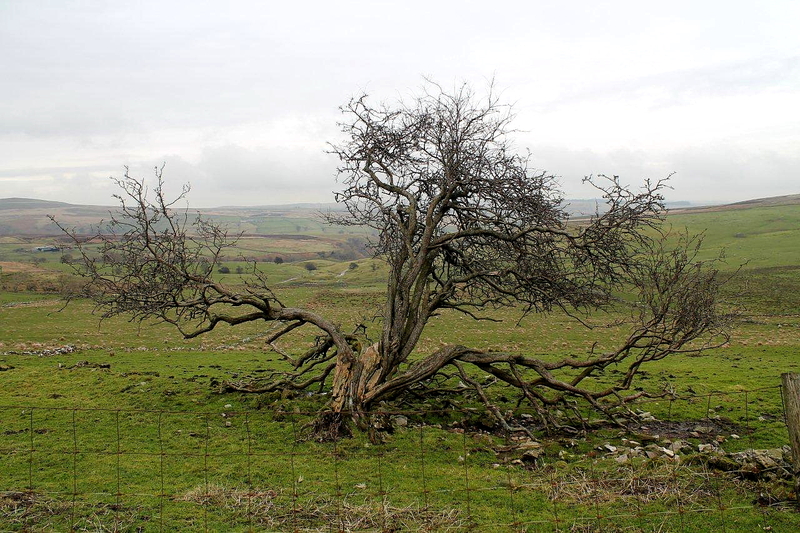 I haven’t been to Bowland for donkey’s years. It’s a nice area, from what I can remember. Bought some pigeons in Clitheroe once, not that that’s anything to do with it. 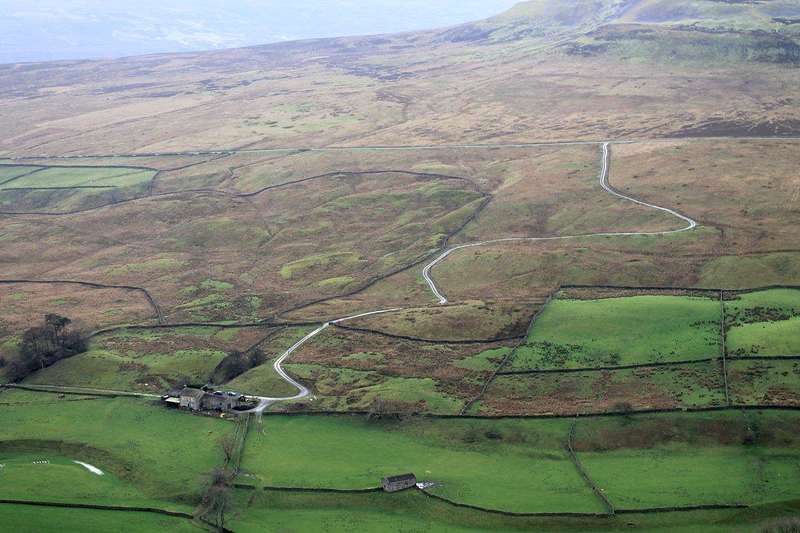 But I’ve never been up Pendle so perhaps I should put it on my never-ending list of things to do. Good walk that! I hope the pie didn´t dissapoint! Charles, the pie was absolute bliss. It was served with mashed potatoes and Brussels sprouts fresh from the allotment, washed down with a bottle of Rioja. A perfect end to the day. I´m relieved about that. It was only afterwards that I thought it might have been booby trapped! Your puzzled look over the pie had me in absolute stitches, thank you for cheering me up. BTW great & as interesting as ever. Hi Paul. I’m good at puzzled looks because I’ve been doing them most of my life. I might audition for drama school now that I need a job. Fancy doing a double act? We could be the Chuckle Brothers of the great outdoors. Hi Iain. 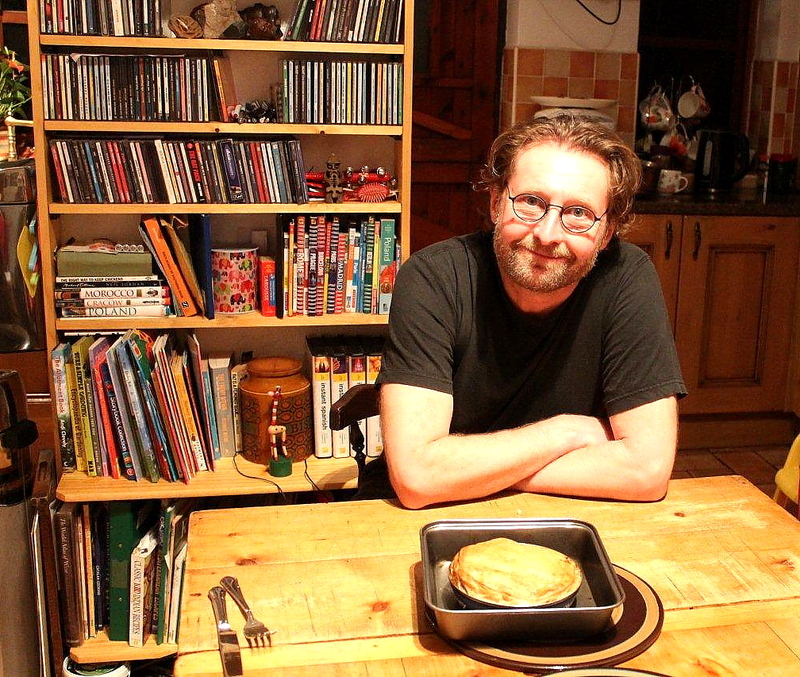 Like the Ring of Brodgar and the secrets of the Pyramids, the pie will forever remain a mystery. I expect it will be baffling historians for generations to come. A nice good-humored tale that brought me very far and wide, Alen. From sniper rifles to Himalaya. 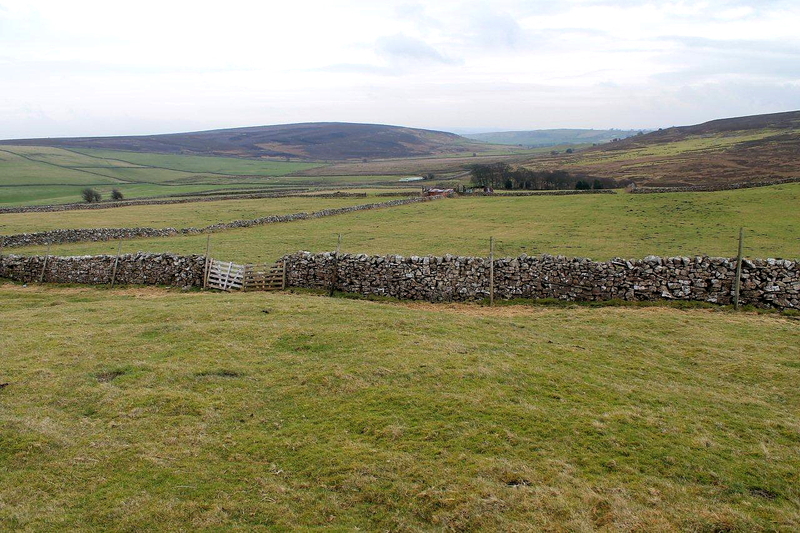 And further the journey went to Buenos Aires and up to the right Fremington Edge to the cairn with the beautiful view. From Robert Burns to A Moose Loose Aboot the Hoose to a concern about the now soon 4 year old granddaughter get lemonade and packed lunch on the forthcoming hike with tall tales. I love the theory of Fray Bentos’ Pie. Speaking of foraging then the meal would be complete with two main courses starting with a fat red grouse. Hanna, you never fail to make me laugh. Thank you for that. And again you have given me an idea. 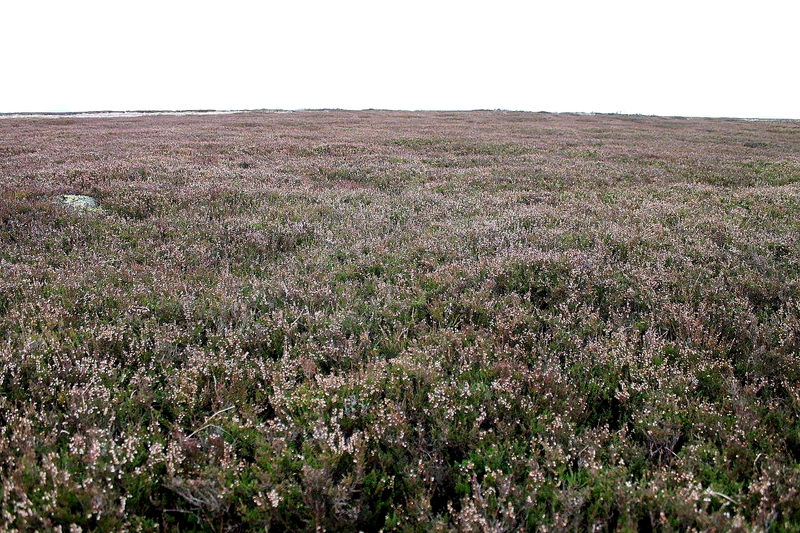 I’ve never eaten a fat red grouse, so perhaps I should go on a quest for one. But it would be fraught with danger because they are guarded by the landowners and their game-keepers, all of whom carry guns. It would make a good post, though. Foraging is a worthy passtime because it gets you into the countryside and produces free dinners. 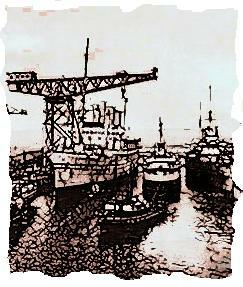 We used to gather all sorts of fruit and fungi, and shellfish from the shore. There’s another idea for the future! Walking for food. I’ll certainly put that one on the list. Ha ha. The osprey dropped the can on the grouse’s head? That makes the tale even better. Nice find that pie – always makes me laugh when you see food that’s been dropped and is completely sealed up but, if someone sees you pick it up and later eat it, they screw their noses up! I’m quite a scavenger when I’m out – I’m always finding wrapped bars of choccie or boiled sweets and invariably pick them up and eat them on my walk. Hasn’t harmed me yet! Now you’ve reminded me of something there, Carol. I was dropping down Craeg Meagaidh with a chap from Glasgow one day when we came across a bum-bag that must have fallen off someone’s belt. Inside was a lump of Dundee cake that had a sell-by date that was three years out of date. We were both hungry so we halved it and wolfed it down. Didn’t do us any harm, either. I’ve always maintained that sell-by dates were invented for the benefit of the food industry to get us all emptying our cupboards and restocking them on a regular basis. I’ll just mention the light on the photos. I’ve been using a Canon Eos 1100D for the past year, but I’ve found it takes very dull pictures. There’s some software that came with it called Digital Photo Professional which really cleans up the images and brings out the colours. It’s very easy and tempting to go over the top but I’ve tried not to. Believe me, cake, sweets and chocolate don’t have a sell/eat-by date – no such thing for sweet stuff. Well, cake would eventually go mouldy but sweets and chocolate, while getting less attractive, can’t really ever go bad. I’ve had chocolate bars well over 10 years old in my coat pocket or my walking bag and they’re fine to eat when I eventually get to them – usually a bit tatty and squashed but taste just the same. Hi Graham. Sounds like it’s time for you to take another trip up there. If you find a pie, drop me an email. 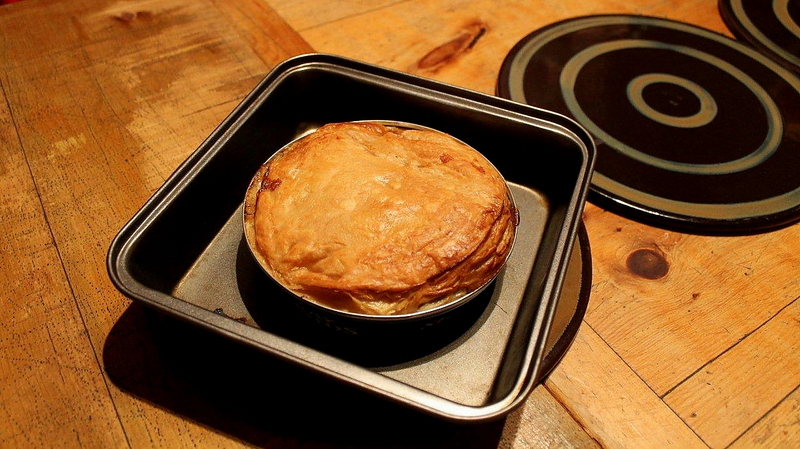 I had completely forgotten all about Fray Bentos pies in a tin. I lived on those when I moved out of my parents home. Bloody marvellous they are, i am going to have to get one now. Mine workings are so interesting aren’t they. When i come across some i stand and let the images of the workmen and women, possibly kids as well, fill the scene in my mind. Real history, not this national trust grey green nonsense. Hi Paul. I agree with everything you say on pies, history and the National Trust. Don’t get me going on that organisation with its sanitised history and monuments that are far too expensive for a family day out. I think I could live on Fray Bentos pies as well. They beat KFC and burgers any day of the weeek. Jo, you have hit a nail on the head that I completely overlooked. The Vikings had a goddess called Freya – who was associated with beauty, sexuality, fertility, war and death. I don’t think I’m wrong in saying that Friday – Freya’s day – is named in her honour. The leap to Freya Bentos is a logical step. I’m going to look at more pictures of the Lewis chessmen now to see if one of them is eating a pie. Crikey! You’re right – it makes perfect sense! How else would the Vikings fortify themselves before a spot of pillage? I think we’re onto something! Great post, lovely photos, amusing about the pie. Your posts are ones I never miss, although it’s becoming difficult (life going on, stuff like that) for me to leave many comments. But, thank you! Hiya Jeanne. It’s always great to hear from people in different continents because it makes the world a much smaller and more intimate and friendly place. And that’s one of the things we need. Thanks for the comment. Another terrific post! I risk becoming addicted to the pies though! Then you shall join a happy and contented band, my friend.